When many had given up hope of seeing a great superhero game, at the height of the best Triple A, Rocksteady returned our faith with Batman: Arkham Asylum, a sensational adventure starring the Dark Knight, who was not only enjoyable for comic fans which is based, but also was highly recommended no matter how familiar they were with the character players. After a great sequel that gave way to the open world, called Batman: Arkham City, and a third installment which was somewhat below probably because it was not developed by Rocksteady, already fully committed to the game that concerns us now Batman makes the leap to the next generation consoles and PC again with Batman: Arkham Knight, which apparently is the latest installment to sign this study. 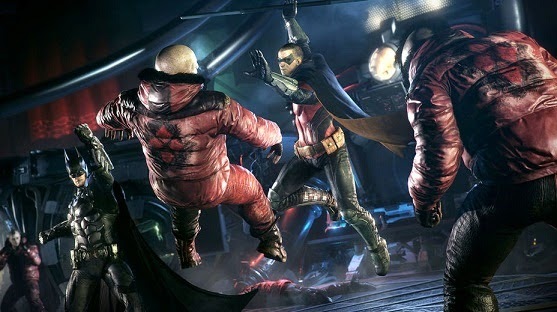 Since late 2011 that hurl Batman: Arkham City until this June to be launched Batman: Arkham Knight , Rocksteady has been working on that easily, will be its most ambitious project to date. During these three and a half years, the studio has been preparing for the new generation of consoles, something a little risky for a project, we are confident, have a big budget behind, but judging by how sales are of new machines. It has proved a success. Obviously, we understand that many players who have not yet made the leap not see it that way, but focus on new machines and powerful computers is a sign of not having to sacrifice elements that otherwise would have had to be left out. First, and as you already have in our impressions of the game at E3, it is the introduction of the Batmobile. Far from being a mere means of transport, the vehicle will be a crucial element in the gameplay, also being perfectly integrated into the combat. The new Batmobile, much along the line of sight of those seen recently in the film, also has a "combat mode" that allows us to shoot, introducing a small component of shooter that feels great to action. Furthermore, it appears that there will be sprints, with circuits designed especially for it. Another great novelty playable, and we've met a few hours ago, is that you have a system that will allow us to switch between the main characters during combat. Batman, Robin, Nightwing and Catwoman confirmed, we can alternate the different abilities of each at any time and can make combos and adapting quickly to the needs of the battle. In addition, one or other, combat becomes even more fluid and can finish off enemies on the ground without having to end the streak of hits. We can finish them stealing their weapons or making use of the environment, something that will give variety to the action. We will also see that weaker rivals can make their own attacks loaded with the strongest enemies of previous installments, which will be the most intense battles and force us to improve the timing of combat, using batarangs, or, of course, take advantage of the aid our peers. We are confident that this opportunity will give much play, and hope that Rocksteady know create situations that force us to make the most. Of course, it seems that no freedom to switch between them out of combat, so the main development will limited to Batman. We said before that this may be the most ambitious project that Rocksteady has ever embarked, and the proof is that the map is five times larger than that of Batman: Arkham City, with lots of destructible elements and secondary missions Enigma, or hacking minigames. The character roster expands not only the heroes mentioned, but Azrael and Barbara Gordon, who will take the role of hacker under the role of Oracle. Regarding the enemies, history and warns us that we will have a lot of them. For those who do not know, it develops a year after the events of Batman: Arkham City , when in full Halloween, the more than six million people of Gotham take leave of peacefulness in the city after threats Scarecrow . It will not be the only villain that we will face, since the Penguin, Two-Face, Harley Quinn, Enigma, Firefly and Poison Ivy are added. Arkham Knight full stop, the "Knight of Arkham" giving subtitle to the game, and many describe as a mechanized version of Batman deserves. This villain is brand new and has been designed exclusively for the game. If we want to know their history we have to read us Batman: Arkham Knight - Genesis, a series of six comics written by Pete Tomasi, who has worked on many comics featuring the Bat Man, among many others. To further expand the adventure we will have a series of downloadable content. The first is played by Harley Quinn, who will have their own story (in fact, lead us to rescue Poison Ivy), their own weapons and abilities, and maps of challenges. The version of PlayStation 4 will have a series of apparently exclusive downloadable way of temporarily including some missions that we have to face Scarecrow costumes Justice League 3000 and the classic series of the 60s and an appearance for the Batmobile. Finally, we know that some stores offer a focused Red Hood story, with this mission as a playable character. We can not forget your season pass, which the not inconsiderable figure of 39.99 euros, provide new content to be released during the six months following the launch of the game, including new missions, supervillains, appearances to the Batmobile, maps advanced to the challenge, alternative appearances for characters and new racetracks mode. Rocksteady has managed to take the figure of a hero and make it a game with a quality almost unprecedented in this subgenre that would adapt the comic consoles. Now, with Batman: Arkham Knight and a new generation of machines to squeeze, it seems that the Dark Knight star in an adventure that will delight not only fans of it, but anyone who enjoys good games The Batmobile, power switch between characters in battle and five times bigger map are already more than enough reasons to know that we will enjoy Batman: Arkham like never before, and we hope that everything else will accompany. If all goes well, in just a few weeks-the 23 of June One we can do on Xbox, PC and PlayStation 4. In PC mod this game look so fantastic and sensational adventure. The theme is really inspired me and i just love the characters.